When the weather gods give you unseasonably warm weather at the end of November, you take advantage of their goodwill and set up front porch Christmas decor while you can! So, I did! Actually, Mr. B's mother and I did. 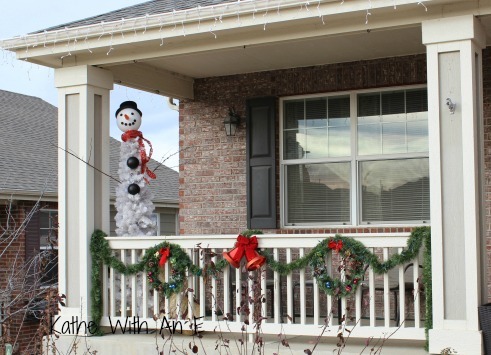 We got some wreaths and garland from Walmart, added some picks and lights to them and along with some bells in my Christmas stash, we Christmasfied the front railing. While we were being all creative, Mr. B put lights up on the house. This is our second Christmas in the house but the first year putting up lights and I am thrilled! 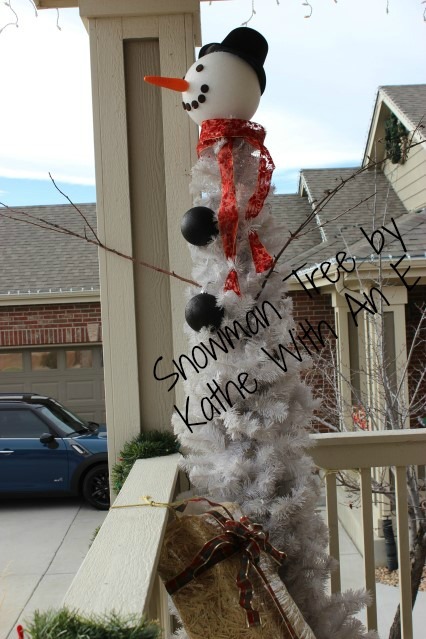 Since last year I had seen several versions of a snowman tree and I had a white tree I could no longer use so...the mother-in-law and I created our own version! I had purchased the large black ornaments for buttons and his top hat after Christmas last year. In casual conversation with my neighbor last winter I told her my plans but how I was unsure what to do about a nose. Being the great neighbor she is, while she was on vacation in AZ a few months later, she found a carrot jumping rope at a dollar store! Have you ever seen or heard of a carrot jump rope? Weird? Yes! Perfect? Yes! Mr. B even used the rope from the jump rope to secure the snowman tree to the railing so he stays upright in our windy weather. A couple of glue sticks were used to get his hat and nose to stick to his Styrofoam head that was also hot glued to the top of the tree. Some thin branches I had saved from pruning some trees are his arms. His eyes and mouth came from Mr. B's creative bad self. He suggested we use those felt pad for under chair legs. We have a bunch of them and, although they are sticky, I hot glued them on to be sure they stayed. MIL and I then added some ribbon for a scarf and two strands of clear lights so that he is seen in all of his glory at nighttime. 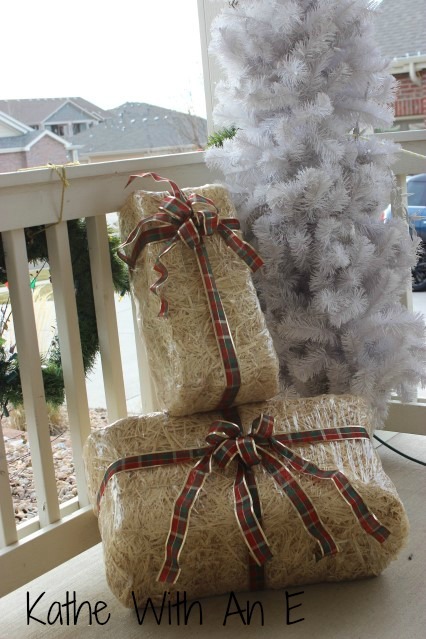 Not wanting to waste anything, we wrapped ribbon and bows onto the straw bales I had used for my Fall porch decor and set them at the foot of the tree. When we were all done and stepped back to see our handiwork, my mother-in-law and I giggled like schoolgirls! 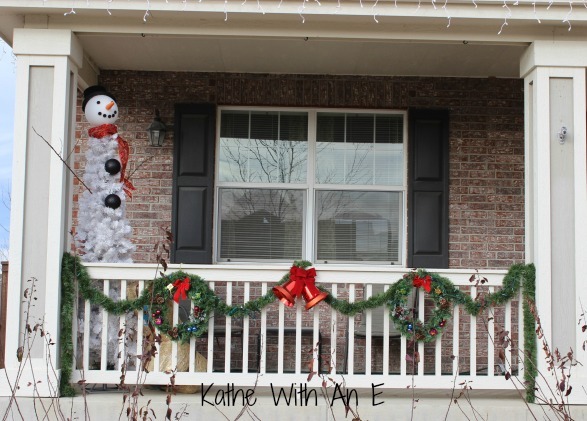 We both love decorating for Christmas so much and doing up the front porch was one for the memory books for sure! Now, onto the inside of the house! Oh my, how I love that Snowman tree! What a fantastic idea! He is so cute! How fun. You all three did a fab job. All I got done outside during the one day the wind isn't blowing a gale was putting up lights across the front and barely got that done when a cold front blew in forcibly. He is so cute ... love that long carrot nose. First Snowman tree that I have seen ... good job Kathe and Mr. B. 's mother. Such fun !!! That is just adorable! Love him and really? A carrot jump rope? You are a lucky lady to have such a great neighbor! Cute porch decor, Kathe. I've been working inside. Our tree is up and still fluffing other things. Hope to be finished tomorrow or Tuesday. Feels good to have it done so early. What a fabulous idea & best of all, it was a good afternoon all spent doing it together - in the spirit of Christmas …. Love your snowman tree! So creative! One of the best that I've seen! Looks like you and hubby had fun putting it together! Too cute! I love your snowman and the creativity that went into it. I wish my front porch had a railing... I'll I ever manage to do is get the Christmas lights up! 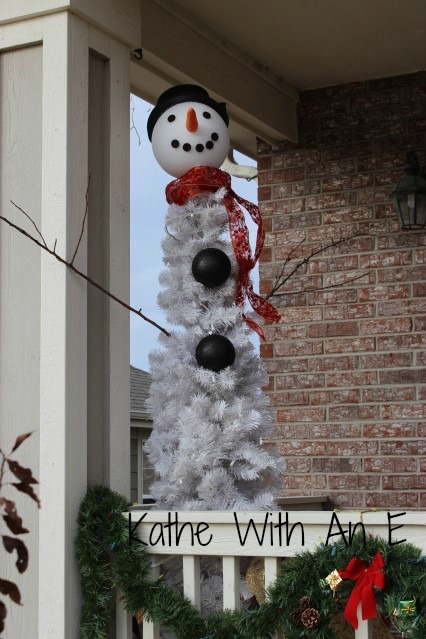 Kathe, your snowman tree is so cute - love him. We have not done any outdoor decorating and may not this year as we have only been here a month now. The inside is going to take all my creative thoughts this year but, next year I hope to be able to do the porch. Love yours. Kathe this is adorable!! Love Love it! You and Linda are having way too much fun! Great idea to use an old white tree! He really is cute. Glad you had temperate weather. We however did not. My husband nearly froze yesterday trying to get the last of our outside lights up! Way too cute!!! What a great idea. We just recently put a new porch on our house. I have been feeling uninspired as to how to decorate it until now!!! Thanks Kathe! Too cute for words Kathe !!! Fun and festive! I decorate tomorrow and this should put me in the mood! Thanks for sharing. 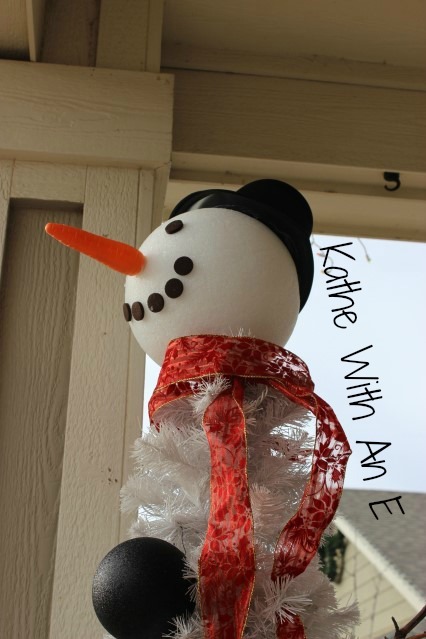 Kathe, your snowman is the cutest thing I've ever seen! I've never seen a snowman tree before. It's such a cute idea! Thanks for joining us for Hump Day Happenings. Such a cute idea! I love the snowman in the corner. Thanks for sharing with Foodie Friends Friday! Great post! This is a great idea for Georgia weather! I'd love for you to share your posts on my weekly link ups each Wednesday. The link up for this Wednesday is still up and running if you'd like to come link up. I host a new link up each Wednesday and they last a full week, so come link up most any time at somuchathome.blogspot.com. That snowman is adorable. Thank you for sharing at The Southern Special. So pretty-love the snowman tree! Cuteness overload! What a sweet friend to find you the perfect carrot!